You know what makes a good book? When you know, know, you should go to bed because you're getting over a heavy cold but you can't put the blasted thing down. THAT'S a good book. I finally read this book by one of my favorite contemporary authors. I mean, I picked this book up on Monday evening, after finishing Thud and I finished this book last night. It's 400 pages with footnotes. I read every page. 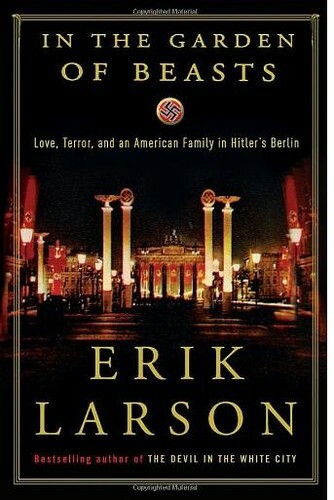 I first"met" the writing of Erik Larson back in 1999 when he released a book entitled Isaac's Storm. It's about the Galveston, Texas hurricane, how it wasn't adequately predicted by the National Weather Service, how that service was highly politicized and how things changed as a result of the death and destruction of this hurricane. It's never been officially named, but the Isaac referred to in the title was in charge of the weather bureau in Galveston and was blamed for the huge destruction and loss of life when it really wasn't his "fault". In that book, the hurricane "hit" Galveston as my reading approached 2 a.m. I simply couldn't put the book down. I needed to know what happened. Larson's next book is Devil in the White City. This is a fantastic book for someone living in Chicagoland. It's about H. H. Holmes and the hotel he kept at the fringe of the World Columbian Exposition. The "white city" is a reference to the buildings of the fair which were plywood and painted white. This book didn't have the reach out and grab me point but the whole thing was tinged with an "I know that place" feeling. The hotel is long gone but the remnant of the World Columbian Exposition are still part of Chicago and one of the most beautiful parks in the city. In between Devil and In the Garden of Beasts, is a book entitled Thunderstruck. I haven't read that. While Issac's Storm, Devil in the White City and In the Garden of Beasts received rave reviews, Thunderstruck was less well-received. Thunderstruck is in my "To Be Read" pile and I will get to it, but the topic of In the Garden appealed to me very much. This book covers the years when William Dodd was the Ambassador to Germany in the 1930's and the lead up to World War II. It is told from the family's perspective, more from Dodd and his daughter, Martha's, perspective than from his wife and son's viewpoint. It's probably because, unlike Dodd and Martha, they didn't leave volumes of papers to be poured over after they died. Larson does meticulous research and read all these papers and anything else he could find about the Dodds and the time period in German history. With recent events in the world theatre causing the "just like Hitler" tag to be brandished about, looking back at what Hitler actually did should be required by anyone seeking to sling that moniker around. I like history. I like reading about it. I'm selective in what I read, what I examine. I believe in the aphorism, "Those who forget history are condemned to repeat it". This was something Dodd believed in, too. I know a fair amount about the causes of WW II, but in this book, I was shocked by what happened in Germany that I didn't know. It's never been mentioned to me before. To say, "Hitler was a madman" does not adequately cover the events of the 1930's. If you are a student of that era or simply would like to read more about it, this book should be in your pile. Larson tries to take an neutral view of Dodd. He was a history professor at the University of Chicago. He was not the first, second or even third choice for the vacant ambassador seat. Roosevelt appointed him personally and there was no confirmation hearing at that time. Now days, Dodd wouldn't have been selected even if no one, not one person in the current administration's staff or donor list had wanted the job. He had health issues. He had grown children who were, at best, still emotional children and their antics, as reported in the book, would have caused Dodd to be relieved of his post within a couple months of his appointment. His daughter slept with anyone she felt like sleeping with. She fell deeply in love with an avowed Communist and became sympathetic to that cause, at a time when this was an anathema to the administration. She and the man she ultimately married (not the Communist), had to flee the US and settle in Prague because of their personal Communist leanings. She used her feminine wiles to get into the inner circle of Hitler's advisers. She was privately reviled by other members of Dodd's staff. His son makes small appearances and, it seems, that's what his whole life played out to be. He took advantage of the opportunity to study at Dresden University, but he was well-known at Dresden bars and it's intimated that Dodd had to shell out some cash to get young Bill Jr out of trouble. At some point, he gave up his studies but it's never explained why. Mrs. Dodd followed her husband wherever his career took him. She preferred urban life, while Dodd purchased a farm in western Virginia and spent some of the happiest times tilling the soil, raising livestock and growing fruit trees. She seems to have not liked moving to Berlin but she made the most of it. In the book, she seems more like the flowers placed about the house they rented when they were there, decoration and something that is little considered. Without substantive papers, I'm sure it was a problem to give Bill Jr and Mrs. Dodd any kind of fleshing out as characters. The events of the 1930's play out as they affect the Dodd household. There is a gradual suppression of rights. We all know Jews were oppressed to the point that most lost their jobs, their homes and their lives. People who has "suspicious" last names were branded Jewish and were harassed. What I didn't know was that when Dodd arrived in Berlin in 1933, Americans with Jewish names were being pulled from their homes, taken into "protective custody" and then beaten. Several had turned up at the US Consulate showing incredible injuries. Dodd was thrown into having to demand apologies for this mistreatment of Americans and then listen to the half-hearted promises of them ceasing. He came to the post thinking perhaps the Hitler Regime was on the right track in attempting to pull the country up from the world wide depression in which every country found itself. US creditors, who had been guaranteed war reparations from Germany for the first World War, were clamoring for Dodd to exert pressure on the German government to make good on these payments. I knew that this debt made Germany resentful. What I didn't know is that US banks and creditors charged exorbitant interest which kept Germany bankrupt. Imagine this. They viewed Germany as a cash cow. Germany could have paid back every penny demanded in the Treaty of Versailles and they would have made a lot of money. With interest, Dodd recognized that these US creditors were making out like bandits. He developed some sympathy for Germany's struggle because of this. I didn't know Germany passed a law that every citizen had to stop what they were doing and give the Heil Hitler when a parade of Storm Troopers passed by. The original law was worded vaguely so when foreigners were caught not giving the salute, they were arrested. Protesting the arrest to a policeman usually got you a laugh. Dodd protested and a directive, largely ignored, was sent out saying foreigners were not to be arrested or detained for not giving the salute. In what became known as The Night of the Long Knives, Hilter, in a rage, swept through his government and killed hundreds of people. The official tally is not known. The Dodd's knew many of the high ranking officials who were murdered. It was at this point, that, privately, any feeling of the rightness of Hitler's cause flew from the Dodd's point of view. Dodd still had to tread the official path. He could not condemn what Hitler had done but he refused to attend any kind of Hitler-staged event after this. He started to, in missives sent back to the State Department and President Roosevelt, express the view that the US needed to denounce Hitler or war was inevitable. Dodd, repeatedly, met with stonewalling or silence or the condescending tone of superior officers who had, all along, thought him unfit for the position. Dodd was relieved of his position in November 1937 and, by New Year 1938, had been replaced. That ambassador, Hugh Wilson, spent his time pressuring Germany for repayment of debts owed the US from World War II. Germany only laughed at him. We all know what happened in the fall of 1939. Dodd had been right. I got to the point, last night, where Dodd was ill again in 1936 and was taking of leave of absence to come back to the States and rest. Events in Germany were steamrolling ahead. More and more people disappeared. More and more of Berlin and the countryside was closed to foreigners. The Dodds saw the increasing persecution of the Jews in Berlin as another event leading up to war. Larson touches, ever so briefly, on the German mind set. Why would the average German allow someone like Hitler to increasingly restrict freedom? People were encouraged to rat on their neighbor. Paranoia took a form and people didn't meet in groups. If you hosted diplomats or intellectuals at parties, you were suspect, even if it was your duty. It was all part of breaking the spirit of the people to make them blindly follow, without asking, what Hitler wanted to do. So much of the German side of this story was not known to me. Larson reports the laws, the events, the parties, the conversations matter-of-factly. The Night of the Long Knives, left me horrified. I knew about Kristallnacht, but this other event I didn't know about. The cold-bloodedness of the event, the rage attributed to Hitler to make him order murders, the extreme dislike of Hitler's associates for one another, all of this is mentioned in this book. The Third Reich was mad and this collective madness caught so many innocents. I had to keep reading to find out what happened to Dodd and his family. I finished the book at 12:45 this morning. I feel sort of drained having read this. I'm so much more informed about this era of history than I was before. I feel a sense of sorrow for Dodd. He wasn't a diplomat. He was thrust into the world stage when all he wanted to do was write a history book. He was vilified when he was right because people chose, at that point in time, to not see. If you have any interest in this period of German and US history or of history in general, you owe it to yourself to read this.